BAMBI DIAMOND EDITION - The Walt Disney Studios proudly announces the addition of BAMBI to its coveted, cutting-edge Blu-ray™ Diamond Collection line-up of Disney’s greatest animated-classics. Released from the Disney vault for a limited time only, BAMBI Diamond Edition features the loveable and adorable wide-eyed fawn and his forest friends in Blu-ray high-definition on March 1, 2011. The Diamond Edition debut of BAMBI, Walt’s fifth full-length animated classic, is an endearing tale about a young prince of the forest who learns valuable life-lessons about friendship, love, and the miracle of life. The movie is a must-own coming-of-age story that Walt Disney Studios Home Entertainment has especially packaged with families in mind – providing the ultimate, interactive hi-def home entertainment experience with a newly enhanced digital restoration, enhanced picture and sound, games, activities and more. 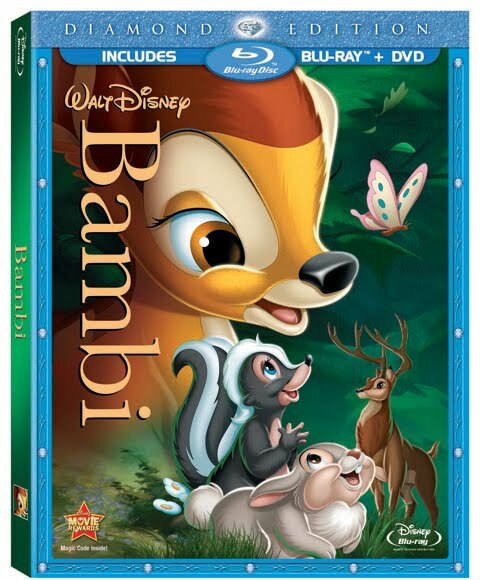 The new BAMBI Diamond Edition will be available as a 2-Disc Disney Combo Pack (Blu-ray + DVD) for the suggested retail price of $39.99 US/$46.99 Canada, a High Definition Movie Download for the suggested retail price of $19.99 US/$39.99 Canada, and/or a Standard Definition Movie Download for the suggested retail price of $14.99 US/$24.99 Canada. Those who wish to own the standard definition DVD version of BAMBI will need to wait seven additional weeks – until April 19, 2011. Disney’s new “Second Screen” technology, which is being introduced for the very first time on the BAMBI Diamond Edition release, will further transform the at-home movie watching experience by empowering viewers with the ability to engage with film content on multiple media platforms and bring them to life in their own hands at the touch of a button. By simply downloading the new Disney Second Screen App onto an internet-connected computer or iPad™* and synching it to the movie, consumers will instantly be able to dive deeper into the film by engaging with fun interactive elements like animated flipbooks, galleries, photos, trivia and more. Disney’s Second Screen technology is not widely available in all territories. As morning light breaks across the meadow, a young deer named Bambi is born and hailed as ‘Prince of the Forest.’ Soon Bambi emerges from the thicket on wobbly legs, much to the delight of his new friends, Thumper, the playful rabbit, and Flower, the bashful yet lovable skunk. But the fun of nibbling on fresh blossoms and frolicking through the woods is only the beginning. Exploring his new world, and guided by the wisdom of Friend Owl, Bambi learns valuable life lessons with every adventure – experiencing the power of friendship, family, and love along the away. BAMBI was Walt Disney’s fifth animated full-length feature film which released in 1942 during World War II and took approximately five years in the making due to the exquisite artwork and attention to detail of each and every scene, character and figure. 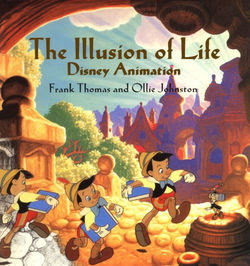 The artwork itself was created by some of the legendary “nine old men,” including Frank Thomas, Ollie Johnston, Marc Davis, Milt Kahl and Eric Larson and in order to achieve the film’s unprecedented level of realism, animators modeled anatomical studies using live animals (including a pair of fawns named Bambi and Faline) and imbued each with a uniquely endearing personality. Bambi’s delightful forest home received the same painstaking attention to detail, as background artists painted hundreds of landscapes based on extensive field research and nature photographs. Walt Disney broke the longstanding animation tradition by casting child actors in the roles of Bambi’s young animals, including Bobby Stewart as Baby Bambi, Donnie Dunagan as Young Bambi, Hardie Albright as Adolescent Bambi and Peter Behn as Young Thumper. The cast also includes Sam Edwards as Adult Thumper, John Sutherland as Adult Bambi, Paula Winslowe as Bambi’s Mother and Sterling Holloway (the voice of Winnie the Pooh and The Jungle Book’s Kaa, the snake) as Adult Flower. 02.09.11 - As Pinocchio celebrates its 71st anniversary join us for a D23 Hi-Diddle-Dee-Dee party honoring this breathtakingly magical masterpiece. 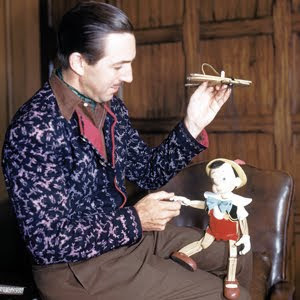 Walt Disney poses with Pinocchio marionette constructed by puppeteer Bob Jones, who crafted the puppet for the animators of the little wooden boy to study. Oscar Night, February 23, 1939: Walt Disney receives an honorary Academy Award® for having produced his first animated feature Snow White and the Seven Dwarfs (1937), and in delivering his acceptance speech, held the sophisticated audience spellbound for 20 minutes as he told the story of what would be his second animated feature. That film was of course Pinocchio, which was to premiere in less than a year, on February 7, 1940. The enchanting tale of a kindly woodcarver whose wish that his wooden marionette would become a real boy is granted has been acclaimed for seventy years as the pinnacle of Disney animation, the sparkling standard by which all other animated films are judged. As Pinocchio celebrates its anniversary, join us for a D23 Hi-Diddle-Dee-Dee party honoring this breathtakingly magical masterpiece. Walt once explained that one of his reasons for selecting Pinocchio to be transformed by the magic of animation was "the many people, young and old, whose encouraging letters suggested that we tell the story of Pinocchio in our medium." The master storyteller reportedly purchased the screen rights to Carlo Collodi's 1881 fairy tale in 1934. Story work on the feature version of Pinocchio began as early as November 1937, a month before Snow White's premiere. Still Walt didn't originally plan on the tale of the little wooden head as his second feature; that was to be Bambi (1942) until that delicate story proved more challenging than Walt first thought (he had assumed the animal characters of Bambi would be easier to animate than the mostly human or human-like Pinocchio characters) but soon Walt had determined that Pinocchio would indeed follow Snow White as his second feature-length opus. Though the original book's highly episodic story was a challenge, it was the title character who proved to be the greatest obstacle. In Collodi's story, Pinocchio is a problem child, er, puppet — he's a deliberate and dedicated delinquent who learns the hard-headed way to be good — and the wooden boy proved to be exactly that for the Disney story artists and animators. From the first Walt knew the importance of somehow making Pinocchio a sympathetic character, saying at an early story meeting, "We ought to get all the comedy we can on the thing, because if [Pinocchio is] cute and likeable and full of little tricks, [the audience is] going to like him right away." Early animator's model (maquette) of Jiminy Cricket, showing an early, more insect-like design. "The first cricket we drew was taller and closer to a grasshopper or bug," revealed supervising animator Ward Kimball. Ultimately, in February 1939, Milt Kahl designed a new model emphasizing Pinocchio as an innocent little boy rather than a wooden marionette. "They were thinking in terms of a puppet — naturally, because he was a puppet," stated Milt. "[But] I handled him as though he were a little boy. The fact that his arms and legs were wood didn't matter. He was still basically a little boy, and Walt liked it very much." Besides Frank, Ollie and Milt, most of the other artists Walt would later dub the "Nine Old Men" of animation came into their own on Pinocchio. The film became a spectacular showcase for their considerable talents. All had worked on Snow White and the Seven Dwarfs (1937) in various capacities, but with Pinocchio, the supremely talented group worked their magic in a way worthy of the Blue Fairy. Only Marc Davis, busy with pre-production work on Bambi, was not part of the Pinocchio team. A unique leading character such as Pinocchio required a superlative supporting cast. Walt took a talking cricket (whose brief appearance in the book is ended when the ill-tempered puppet squashes him) and gave him a shining role as Pinocchio's conscience. Such names as Abner and Cedric were considered until Walt suggested Jiminy, envisioning the cricket conscience as "lively, active and a high jumper," Walt turned to animator Ward Kimball to animate the puppet's cute co-star. "I started with a real cricket with toothed legs and antennae," revealed Ward. "But Walt didn't like it. I did 12 or 14 versions [trying to make him cuter] and gradually cut out all the insect appendages and ended up with a little man, really, wearing spats and a tailcoat that suggests folded wings. The only thing that makes him a cricket is that we say he is." Another addition to the story was Geppetto's feisty kitten, animated by another of Walt's Nine Old Men, Eric Larson. Eric drew inspiration from his young nephew in drawing the headstrong Figaro. "Walt just fell in love with Figaro and said just do what you want," said Eric. "Figaro was, say, a three-or four-year-old kid who had a mind of his own. A four-year-old is quick to feel hurt if he doesn't get his way. He is probably going to put on a little show for us, a tantrum. Cleo [the goldfish] was the nice little sister Figaro didn't want to have anything to do with. So you had that nice, typical family interplay. But Geppetto had them around because they were part of his life." The superb personality animation was only matched by the elaborate backgrounds and intricate detail in Pinocchio's production design. "Pinocchio was the most complex story we had ever tried to do in cartoon form, and coming on the heels of Snow White we wanted to do even better," noted background artist Claude Coats. "The result was that we put a good deal more artwork and more elaborate detail into Pinocchio. Geppetto being a woodcarver gave us the opportunity to embellish his house with all sorts of pipes, boxes, clocks and toys. This carried over to the rest of the backgrounds so that we began painting each stone in the cobblestone streets separately. All of the props became ornate and took on a warm Old World craftsmanship feeling." The search for perfection took on the nature of an artistic crusade. Animator Hugh Fraser reported doing forty-eight pencil tests for one brief line of dialog by Honest John the crafty con-fox. "Pinocchio is probably the most beautiful picture we ever made," stated Frank Thomas. "At the time, we had oodles of money and a bunch of very talented people, so the picture is the one that most fully realized Walt's vision for it." December 1939: Walt Disney's most beloved star introduces the newest animated character to the world in Mickey Mouse Magazine, two months before the film's debut in February 1940. Another popular young actor, Frankie Darro was the voice of Pinocchio's bad-boy companion Lampwick. "We tried a few kids on Lampwick, but none of them were outstanding," story director Ted Sears reported at a story meeting, to which Walt asked, "How about Frankie Darro?" referring to the young "tough" well known for playing disreputable jockeys in such film classics as the Marx's Brothers' A Day at the Races (1937). Musician Ned Washington replied, "Frankie Darro has the best voice of any of them." Walt said definitively, "He's a pretty good actor, too." The adult voice artists, too, turned in memorable vocalizations, including character actor Charles Judels from such popular films as San Francisco and The Great Ziegfeld (both 1936) and Ninotchka and Idiot's Delight (both 1939), who voiced both the volcanically tempered puppet-master Stromboli and the Dickensian villain, the seemingly jovial Coachman. Strangely, one of the most fascinating voices is one not heard in the film. Consummate voice artist Mel Blanc was signed to perform the voice of Gideon the cat until Walt decided that Giddy would be a pantomime character; the only bit of Mel's vocalization in the film is a single hiccup. Pinocchio 1940 record album, featuring the words "original soundtrack recording" for the first time in the history of the recording industry. Decades later, Walt Disney Records released a fully restored Pinocchio soundtrack recording on compact disc in 1992 after long-forgotten recordings of the separate tracks — music, dialog, sound effects — were discovered unlabeled in a Disney Studio warehouse. The Pinocchio soundtrack is now available on iTunes. Pinocchio was treated to two gala premieres: one in New York City on February 7, 1940 and the other in Hollywood on February 9, 1940. The reviews were ecstatic, surpassing even the glowing accolades that greeted Snow White, The New York Times declaring Pinocchio "the best thing Mr. Disney has done and therefore the best cartoon ever made." Unfortunately the world, through which the cold winds of war had started to blow, did not seem interested in this fantastical film — perhaps because it's a fantasy, perhaps because it's a dark film, despite its fantasy — and the film underperformed at the box office. Walt was well aware that Pinocchio was the most expensive animated film ever made. "You see, we began to find out we could do things," he later explained, "and boy, we went into effects and things, we were very costly. Well, time had to play its part. Pinocchio has become a perennial." Pinocchio proved its timeless appeal not only through popular re-releases but also by introducing not one but two breakout stars. One of the most popular Disney personalities ever, Jiminy Cricket has become a representative of the whole wonderful world of Disney. Jiminy not only appeared in Fun and Fancy Free (1947) (singing "I'm a Happy-Go-Lucky Fellow," originally composed for but not used in Pinocchio), but also became a major TV star. The wisecracking cricket appeared on the Mickey Mouse Club as the witty, warmhearted host of the popular "I'm No Fool" segments, in addition to lending his folksy vocals (unforgettably performed by Disney Legend Cliff Edwards) to record albums. Sporting more lives than even Thomasina, Figaro became one of the few characters from a Disney animated feature who went on to headline his own films. Starting in 1943, this endearing kitten starred in six cartoon shorts, beginning with Figaro and Cleo, featuring Geppetto's pet goldfish. Figaro even had his own theme song, also entitled "Figaro and Cleo," based on the promotional song created for the original release of Pinocchio, with music by Leigh Harline and lyrics by Ned Washington, delightfully defining Figaro as a cute and clever kitty cat. But beyond its animated stars, the legacy of Pinocchio is in the artistry that glows brighter than ever 71 years after its premiere. Pinocchio's excellence is reflected in the two Academy Awards® bestowed upon it, for Best Original Score and Best Song, "When You Wish Upon A Star." That sublime song, the unofficial Disney anthem, sings of the hope embedded in this phenomenal film that goodness and innocence will triumph, and that, as Walt Disney himself was fond of pointing out, that when you wish upon a star, your dreams come true. 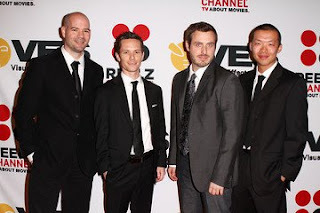 While we didn't take home the VES Award, it was a blast to be there and to be nomminated!